This year Meade Design Group have been very fortunate to be invited by the Art Gallery of Greater Victoria to reinterpret an art piece of their permanent collection in a botanical extravaganza as part of their annual exhibition Art in Bloom. 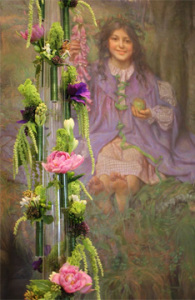 We used a combination of anemones, tube roses, double tulips, mosses and greens accented by drumstick alliums and fuchsia trachelium. We wanted to build up a woodland feeling with berries, mosses and greens, but still have interesting forms and textures with more exotic accents. This is reinforced by the golden graphic that has been applied to the acrylic base which encases the trunk. 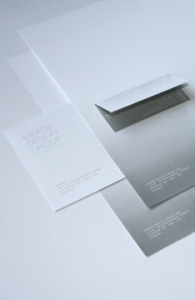 To celebrate the renewal of Meade Design Group we have created a new image for the business, one that embraces our old branding (with the repetition of the horse image and typography of our logo), but also symbolizes our growth and evolution with the use of the gradient and layering of patterns and forms. We also warmed up our colour palette and softened the lines to better represent our warm and friendly working environment. Now that we have put so much work into our networking and accessibility, we wanted to reflect that in our image; we want to be perceived as professionals who are young, fun, and love what we do – design really is our passion!